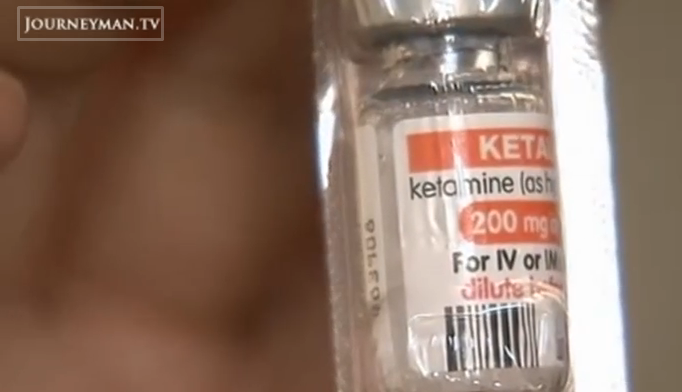 Treatment gives infusions of ketamine no more than once per week. Research conducted at the Neuro-Luminance Ketamine Infusion Centers in Denver has found that ketamine infusions show lasting benefits for many patients with depression with no apparent risk of addiction. The findings are published in the journal Neural Regeneration Research. The results challenge the belief that ketamine has no long-lasting benefits, and that it must be given frequently to provide any benefit. “Misconceptions about ketamine abound among psychiatrists, particularly related to possible chemical dependence problems. However, the neurobiological basis of its benefit for depression has nothing to do with causing addictive risk. Our patients get better after a few infusions and from there treatments can be discontinued,” Theodore Henderson, MD, PhD, president of The Synaptic Space, a medical consulting firm, and co-founder of Neuro-Luminance, a clinical service organization, said in a statement. Dr Henderson has been treating patients with ketamine for over 3 years; rather than following the protocol of Shiroma and colleagues of multiple infusions, the treatment at Neuro-Luminance gives infusions of ketamine no more than once per week. Patients receive an average of 4.3 infusions total. A portion of the patients at Neuro-Luminance consented to make their data available for study. Dr Henderson and colleagues analyzed the first 100 of these cases. In these patients, 51% were women, 99% were Caucasian, and the average age was 41.2 ± 14.5 years. Eighty percent had recurrent unipolar depression while the remainder had recurrent bipolar depression; all had failed at least 5 antidepressant medications; 19 failed to respond to ECT or transcranial magnetic stimulation. The patients’ baseline Quick Inventory of Depressive Symptomatology-Self Report (QIDS-SR) score was 17.8 ± 2.8, placing them in the category of severe depression. Dr Henderson found that 80% of the patients responded to ketamine infusion therapy. Responders showed a change in QIDS-SR score of 10.8 ± 3.5 with lasting benefits over several months, while non-responders showed a 0.8 ± 1.8 change. None of the patients experienced hallucinations or dysphoria. “The wealth of clinical experience from treating hundreds of patients with ketamine has supplanted the preliminary data that emerged from the initial open-label and small double-blinded studies,” Dr Henderson said. Dr Henderson’s findings point to regeneration of brain cells as a critical mechanism for depression relief. “Activation of brain-derived neurotrophic factor (BDNF) appears to have an important role in the antidepressant effects of ketamine. BDNF induces synaptogenesis, dendritic arborization, improved neuronal health, and neurogenesis. These processes likely underlie the persistent benefits of ketamine,” he said. Despite concerns that ketamine could be addictive, Dr Henderson also found that none of his patients pursued getting extra infusions, rather finding that many patients found they did not need all of the ketamine in the treatment package. Henderson TA. Practical application of the neuroregenerative properties of ketamine: real world treatment experience. Neural Regen Res. 2016;11:195-200. doi:10.4103/1673-5374.177708.